With young stars like Patrik Laine and Mark Scheifele, it can be easy for Winnipeg Jets prospects to get lost in the shuffle. But these two members of the AHL affiliate Manitoba Moose prove that the Jets’ prospect pool is deeper than meets the eye. Judson Rempel, lead writer for the Jets here at The Hockey Writers, called Brendan Lemieux and Jan Kostalek “first in the call-up line” in a season preview from September. Now that the halfway point in the season has passed and neither has seen regular season NHL action, here is a closer look at the two Jets hopefuls and what they have done in Manitoba thus far. Acquired in 2015 as a piece in the trade which sent Evander Kane to the Buffalo Sabres, Brendan Lemieux is continuing the family legacy of physical and high-scoring forwards. His father, Claude, had a respectable NHL career — 1,215 games played, 379 goals, 786 points, and perhaps most notably, 1,777 penalty minutes. Not only was he a Conn Smythe winner in 1995 with the New Jersey Devils, but he is widely regarded to have sparked the heated rivalry between the Colorado Avalanche and the Detroit Red Wings with this infamous hit. 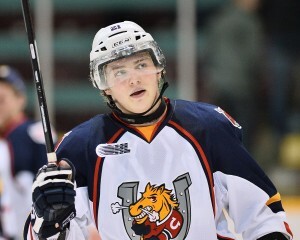 (Terry Wilson/OHL Images) Brendan Lemieux skates as a member of the Barrie Colts, where he played for the majority of his OHL career. His son is surely following in his footsteps, and he doesn’t mind the comparison. The 20-year-old spent his junior career split between the Barrie Colts and the Windsor Spitfires of the OHL, where he had a point-per-game total of .90. Claude said of his son in 2014 that he could have a fighting chance at making the Sabres roster. The transition from junior hockey to the AHL has not been as easy as anticipated. Prior to this season, Lemieux was at the center of a minor controversy that led to his being traded from Buffalo to Winnipeg. The Score reported that Lemieux was a last-minute addition to the Evander Kane deal because he refused to re-sign with the Sabres. Now, nearly two years later, he still has yet to appear in an NHL game and has eight points in 26 games played for the Moose this season. Still, Lemieux is certainly capable of turning on his game, and if he stays true to his playing style, the points will begin to come. Not surprised to see Brendan Lemieux involved in Kane/Myers blockbuster. His agent (Claude) told the Sabres Brendan wasn’t signing in BUF. Simmonds is notable for being hard to play against, not only because of his physicality but because of his ability to score. Simmonds recorded a career-high 32 goals in 2015-16 as a member of the Philadelphia Flyers. That wasn’t his only milestone of the season: Simmonds’ 147 penalty minutes marked another career high. Brendan Lemieux has, on occasion, found himself on the wrong side of that line as well. During the 2015-16 OHL season, Lemieux landed a dangerous hit on Keegan Reynolds of the Owen Sound Attack — so dangerous, in fact, that the OHL handed him an indefinite suspension (that ended up lasting 10 regular season games). Though Simmonds has found himself in hot water on occasion, being traded from the Los Angeles Kings to the Flyers shaped his game. According to an article from The Philadelphia Inquirer, the trade marked the transition from being strictly a fourth-line forward to being a 30-goal scorer for Simmonds. “Obviously, I loved playing in L.A., but I got traded here, and [former Flyers head coach Peter Laviolette] put me into an offensive position right from Day 1,” Simmonds said. Simmonds described the trade as a “blessing in disguise” in that same article, and Lemieux is hoping his trade will have the same effect. Drafted 114th overall in 2013, Kostalek is a poised, puck-moving, two-way defenseman. He joined the likes of Kris Letang in the 2013-14 QMJHL season, winning the Kevin Lowe Trophy for best defensive defenseman. The standards for winning are high; they take into consideration “number of bodychecks, plus-minus differential, the player’s role within the team, and the number of scoring opportunities,” according to Wikipedia. The same season saw Kostalek receive the Emile Bouchard for best defenseman in the QMJHL, and his seven-goal, 43 point season helped lead the Océanic to a Memorial Cup championship. That, he did. Kostalek recorded career highs across the board in the 2014-15 QMJHL season, including 21 points in 20 playoff games. Kostalek’s ability to score isn’t the only thing that stands out. His tremendous poise with the puck is obvious, and many young defensemen lack an inherent confidence like Kostalek has. Even under pressure, he rarely makes plays out of haste, which makes for far fewer slip-ups. Wise decision-making and smooth puck movement made him a staple on Océanic’s power play, and will likely make him an asset going forward. Former New Jersey Devils defenseman Adam Larsson is probably best known for the blockbuster trade that sent him to Edmonton in exchange for Taylor Hall. But there is more to Larsson than just the Hall trade. The 24-year-old Swedish defenseman has made a name for himself by mastering the best of both worlds in offense and defense. Though he dealt with being jerked around between the AHL and NHL, among other struggles in New Jersey, at Larsson’s core is confidence with the puck, quality decision making, and all in all, a great hockey sense — all of which can be found in Kostalek as well. (Adam Hunger/USA TODAY Sports) Adam Larsson pictured as a member of the New Jersey Devils. Compare this to Kostalek’s self-described playing style, and the similarities become obvious. Just like Larsson has proven to do very successfully, Kostalek can join a rush and get back in time to return to defense. He can play as a top-two defenseman and handle the minutes that come with it. Though time-on-ice data is available for neither the AHL nor the QMJHL, Kostalek played over 17 minutes in the Jets’ Sep. 27 preseason game against the Minnesota Wild, and it’s easy to assume that he racked up big minutes with the Océanic. Kostalek is still waiting for a breakout moment in his career. For now, he’s stuck in limbo, having missed 10 of the Moose’s 28 games this season. And Lemieux is still searching for a team who wants to keep him long-term. But their problems aside, Lemieux and Kostalek are two players who push the Jets’ prospect pool into the deep end.